No hesitation to jump on the preparation of this salad: from the moment I saw the post at Fer’s site to enjoying it as our dinner only 20 hours elapsed. Keep in mind that most recipes sit on my “to make soon” folder for months, not hours. Some have been waiting there for a decade! The protein quotient of this salad was increased by the addition of seared scallops on top, with a delicate drizzle of this amazing dressing. One word: awesome. Simmer orange juice in a small saucepan until syrupy and reduced to about 2 Tbsp. It should take a little over 5 minutes. Let cool. 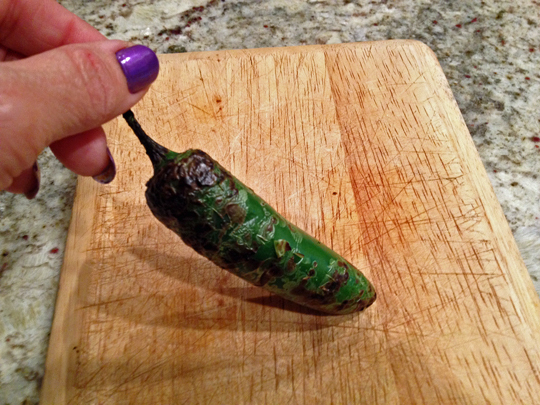 Roast jalapeño directly over a gas flame, turning occasionally, until charred on all sides. Let cool; remove stem, skin, and seeds, then finely chop. Whisk shallot, vinegar, reduced orange juice, and the jalapeño in a medium bowl; season with salt and pepper. Whisk in vegetable oil, then olive oil. Set vinaigrette aside. Toss avocados, orange segments, salad greens, and vinaigrette in a bowl. Serve with seared scallops on top, if so desired. Comments: You might be tempted to use store-bought orange juice for the dressing, but fresh is best, since it will be concentrated by cooking. Also, I wimped out and used only half the jalapeño, but it would be even better with the whole pepper. Go for it and you won’t be disappointed. What a great twist the charring of the jalapeno! I do that all the time with bell peppers, but had never seen a recipe applying the same treatment to a much smaller (and hotter) pepper. Make the gremolata by combining the cilantro, garlic, lemon zest, salt and pepper in a small bowl. Set aside. Bring 4 cups water to a boil in a large saucepan. Add 2 teaspoons salt and the peas. Cook until peas are tender. 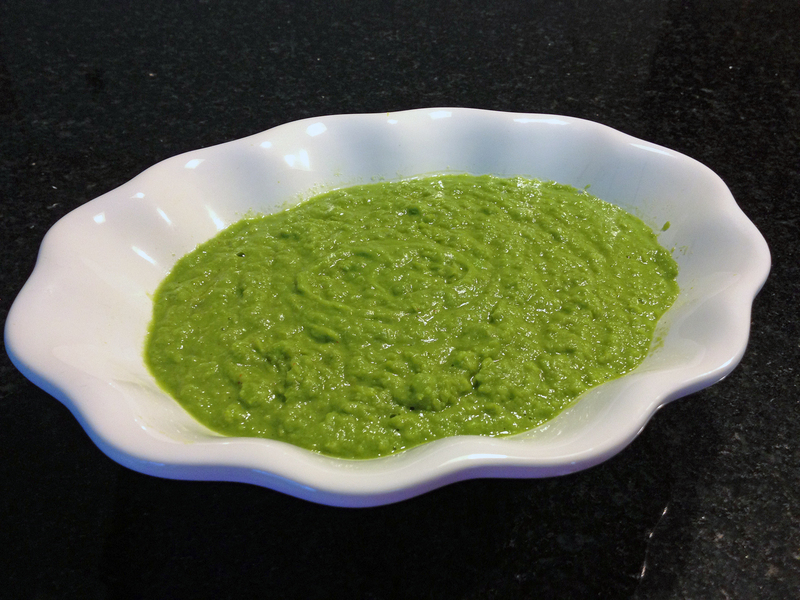 Remove from heat and drain peas, reserving 1 cup cooking liquid. Combine peas, ginger, olive oil, lemon juice, 1 teaspoon salt, 1 teaspoon black pepper and cayenne in bowl of food processor. Purée until smooth. Add some of the reserved water (approximately 1/4 cup) to thin to desired consistency; the purée should not be too thin. Discard remaining water. Transfer purée to a bowl and keep warm. Pat scallops dry and sprinkle all over with salt and pepper. Add a sprinkle of Mycryo right before cooking. Heat a non-stick skillet over medium-high heat. Add half of the scallops, taking care not to overcrowd the pan. Cook, turning once, until brown on both sides and just cooked through, about 4 minutes. Transfer to plate and keep warm. Repeat with remaining scallops. No need to add any oil to the pan, just the sprinkle of Mycryo will be enough. To assemble, spoon pea purée on serving plates. Top with scallops. Sprinkle scallops and purée with gremolata. Serve immediately. Comments: Mycryo is a great product with a poorly chosen name, if you ask me. The word – Mycryo – makes me think of tears, sadness, despair. But that could not be farther from the truth: they gave sea scallops THE most perfect brown ever, even though they were prepared in THE most rudimentary cooking conditions available to a cook (the Drama Queen says hello). I even conducted a small experiment by preparing two batches of sea scallops. One cost a small fortune, they were the ultra-special, huge dry sea scallops. The other was a frozen type that while thawing released a gallon of white milky liquid. No bueno. With a light sprinkle of Mycryo (and no oil added to the non-stick pan), all scallops browned like a Brazilian under the tropical sun! We could not tell the difference in texture or taste between the two types, which was quite amazing to me. Great product! You can order here, they shipped very quickly, contrary to what I heard from customers who got it through amazon.com. 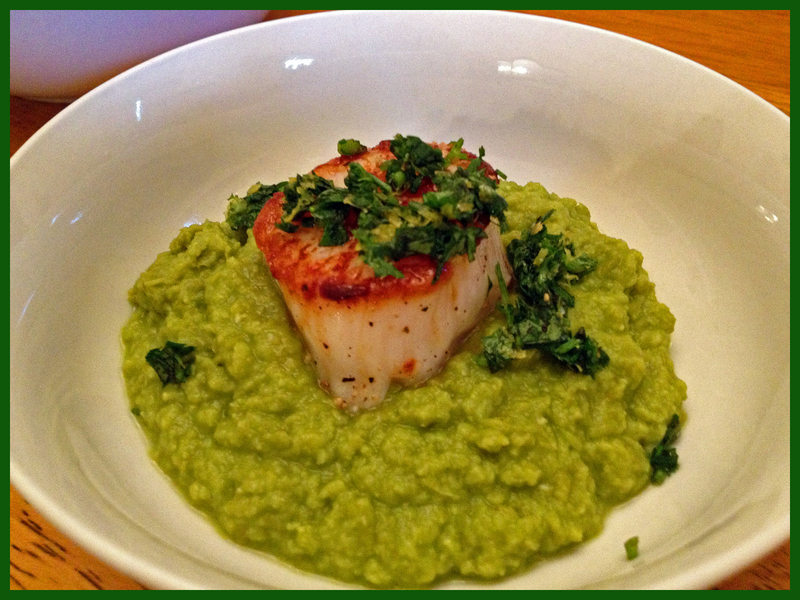 The pea puree competed heavily with the scallops to win the spotlight of this meal. Bright flavor with the ginger and just a slight heat from the cayenne. Lynda really came up with a perfectly balanced side dish. I close this post with a little snapshot of our laundry room. In one side we installed the induction cooktop + microwave. On the other side, where we do have a large sink, we stuffed together the coffee machine, coffee grinder, and our beloved Penguin Sodastream. It’s cozy in there, folks. Cozy. Ideally, my Wednesday special meal will catch Phil by complete surprise, but this time he had been snooping around the depths of our fridge. Just as I was getting ready to cook dinner, he asked me with a big smile “we’re having scallops tonight for dinner, aren’t we?”. Bummer. Just could not get him this time. I had the inspiration for this meal when I brought home a couple of heirloom tomatoes, and was blown away by how juicy and delicious they were. I went right back to the store and bought some more. They turned into a fantastic sauce, paired with leeks and a thinly sliced fennel bulb. Scallops crowned the meal with their touch of class, always welcome. Another Wednesday evening made ultra-special! Boil the water to cook the pasta. Core the tomatoes and cut them in large chunks, but don’t seed them. Reserve. In a large skillet, heat the olive oil, then saute the leeks and the sliced fennel for about 5 minutes, seasoning with salt and pepper. When they are soft and starting to get some golden color, add the tomatoes and half the orange zest. Cook, stirring, until the tomatoes start to melt and release a lot of juice. Cover the pan, and keep at a simmer. Cook the pasta, and when it’s 5 minutes from being ready, heat a non-stick skillet on high heat, add olive oil just to coat the surface lightly. Pat the scallops dry, season lightly with salt, pepper and ground fennel, and sear them, 1 to 2 minutes per side. Reserve some of the pasta water, drain the pasta and add to the tomato/fennel pan, increase the heat slightly, and let the pasta and the sauce cook for a minute or so together. If needed, add some of the pasta water to the sauce. Add the remaining orange zest, the scallops on top, and sprinkle with minced fennel fronds right before serving. 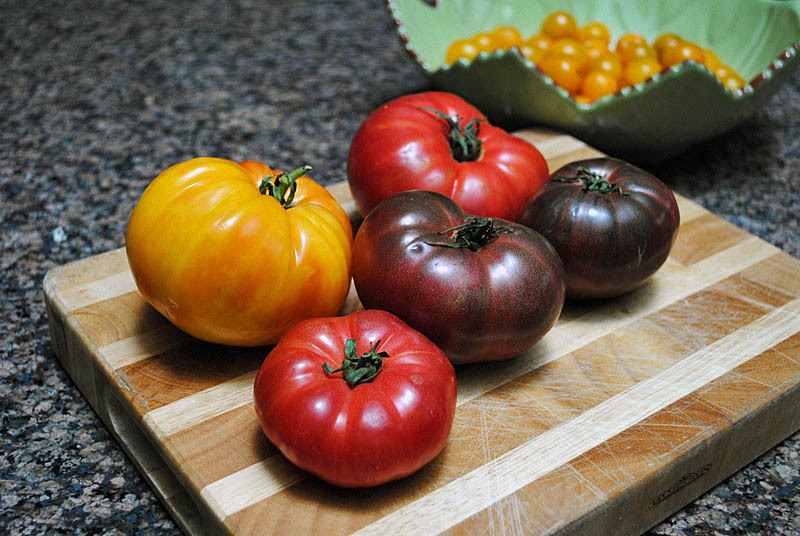 If you make this dish with “regular” tomatoes, it simply won’t be the same, so try to find these funky looking babies, they are superb, particularly the brown ones. We could not get over the flavor of this dish, so few ingredients, but they work together beautifully, and the scallops (make sure you get a nice sear on the outside) are not overpowered by the sauce. Normally I reserve the pasta water to adjust the consistency of a pan sauce, but in this case it was not necessary to add any. The tomatoes did their job providing all the moisture to coat the pasta strands. 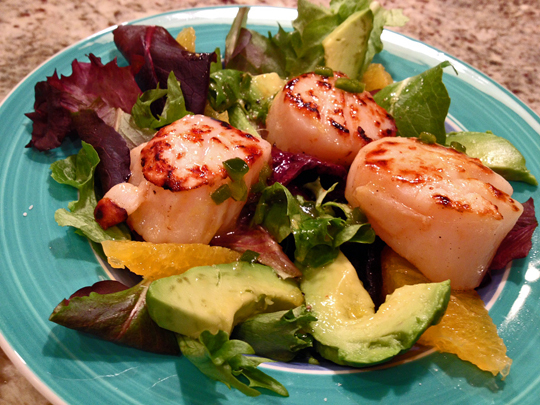 If you don’t like scallops, shrimp could be a good option, or chicken breast filets. If you want to keep it vegan, maybe grilled tofu could work too. But don’t mess with the heirloom tomatoes! Put a large pot of salted water to boil. Pat the scallops dry, and place them over paper towels to make sure any excess moisture is blotted out. Reserve. On a medium size skillet, heat 1 tablespoon of olive oil and saute the shallots, seasoning lightly with salt and black pepper. When they are soft and getting a light color, add the orange zest. Saute for 1 minute, turn the heat off and close the pan. Start cooking the black spaghetti, the amount you would normally make for you and your lucky partner. Depending on the thickness of the pasta and the brand, it should take about 8 minutes. 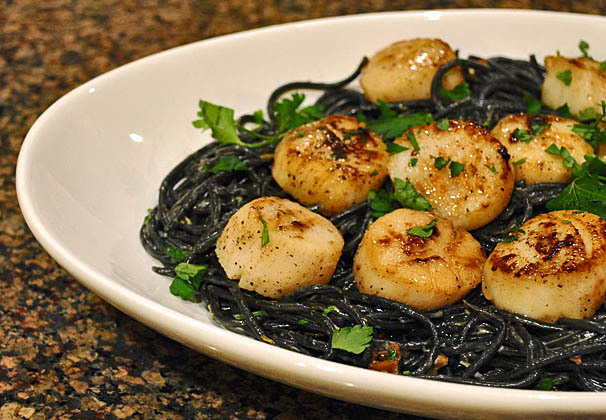 While the pasta cooks, heat a skillet on high heat, add a smidgen of olive oil, and once the oil is very hot, pat dry the scallops once more, season them with salt, pepper, and a sprinkle of sugar. Sear the scallops about 2 minutes per side, making sure the pan is not too crowded. Don’t touch them as they cook, they will release from the pan once a nice golden crust is formed. Reserve (or place in a very low oven – 200 F) to keep them warm). As the scallops cook, finish the sauce. Heat the orange/shallot mixture, add 1/4 cup of heavy cream, season with a dash of nutmeg. Add 1/8 cup of orange juice and warm the sauce swirling the pan gently over medium low heat. Once the pasta is cooked, remove a small amount of the cooking liquid, add the pasta to the orange-cream sauce, add some of the pasta water if necessary to thin the sauce. Sprinkle fresh parsley over the dish, and serve with the cooked scallops on top. Comments: Black pasta is made by incorporating squid ink in the dough, so I like to serve it with seafood. It can be a bit tricky to pair with a sauce, but I opted for a mild, creamy sauce with a citric component. It worked very well. 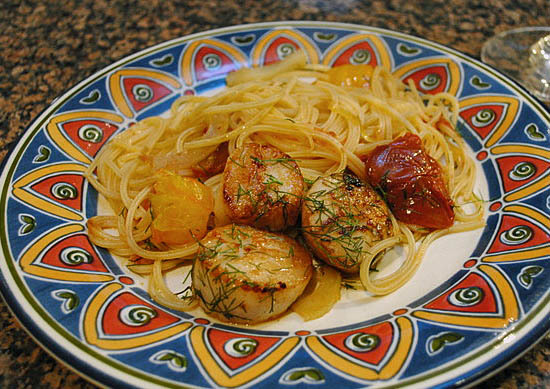 Cooking scallops can be intimidating, they are expensive and easy to mess up. A few seconds longer in the pan, and their delicate texture is ruined. Dorie Greenspan, in her book “Around my French Table,” offers a great take on scallops, with a sauce that was born to embrace them. First, make the sauce. Mix the orange juice and white wine in a small bowl and reserve. Sprinkle the sugar into a small saucepan (see my comments on the type of pan I like to use for this). Place the pan over medium-high heat and warm the sugar until it starts to melt and color. As soon as you see the caramel in the pan turning brown, begin to gently swirl the pan. About 3 minutes into the cooking time, when the sugar is deep caramel in color, stand back and add the orange/wine mixture. It will bubble and spatter, just keep stirring with a wooden spoon, and boil until the sauce is reduced by half — you should have about 1/3 cup. Pull the pan from the heat and set it aside. If not using the sauce immediately, you can keep it for a couple of days in the fridge. Pat the scallops dry between two paper towels. 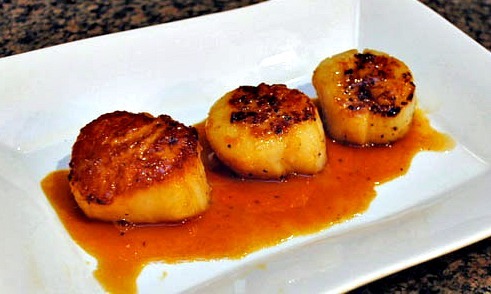 Put the saucepan with the caramel sauce over very low heat so that it can warm while you cook the scallops. Put a heavy-bottomed skillet over high heat. When the pan is hot, pour in 1 tsp olive oil and swirl to coat the bottom. Add the scallops, season them with salt and pepper, add a little more oil if needed, and cook for another 1 to 2 minutes, or until the scallops are firm on the outside and just barely opaque in the center. Transfer the scallops to a serving platter. Check that the caramel sauce is hot, remove the pan from the heat and toss in the butter, bit by bit, swirling the pan until the butter is melted and the sauce is glistening. Season the sauce with salt and pepper, then drizzle some over the scallops, serving additional sauce at the table. To make the sauce, my favorite pan is this cute little red skillet from Bialetti. I bought it when we were in Los Angeles because our electric cooking stovetop was so tiny, I had no pan that would fit nicely on it. Since the pan is white, it’s very easy to see the caramel color, no need to guess or transfer a small amount to a white plate. I strongly advise you to make a double batch of the sauce, I never seem to have enough, it’s so delicious! It would go well on shrimp, and even chicken breasts or pork tenderloin. Slightly sweet, slightly sour, feels complex even though it is made with only a few ingredients.